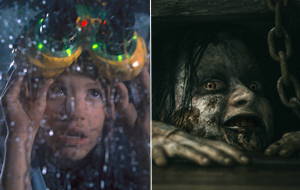 Kicking off April are two films whose box office histories couldn't be much different: the remake of the cult classic Evil Dead and the 3D re-release of Jurassic Park--once the highest grossing film of all-time. - Online buzz has been strong for several weeks. - The fans of the original franchise will be turning out after years of demand for a follow-up/remake. - Texas Chainsaw 3D, and 2010's A Nightmare on Elm Street, proved that horror remakes can still break out. - Will have to rely on bringing out a slightly wider range of horror fans than the niche audience of the old movies. - The film is nowhere to be found on Fandango's Top 5 sellers as of Wednesday afternoon. - The IMAX release and strong marketing campaign could help make this an attractive option for families looking to indulge in nostalgia. - The film is currently second on Fandango's list of best sellers today. - 3D re-releases generally haven't fared well at the domestic box office over the last year-and-a-half. - With the movie's Blu-ray having already released, will audiences care to double down and pay movie theater prices for it again? - Social network tracking has been lackluster. Check out our predictions for these films and the remainder of the weekend's top 11 in the table below.